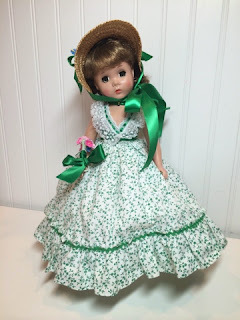 I may or may not have mentioned in my last post that we stopped at a thrift store on the way home from the beach Monday and I bought a bag of doll clothes that contained a very rare Madame Alexander dress. When I picked up the bag I saw a bit of a pinked seam, finished with pinking shears rather than stitching, and I thought it might be by Alexander. Pinked seams and square silver snaps are hallmarks of Madame Alexander's work. If an untagged piece has both, chances are it's an Alexander. This dress, however, is tagged, as I found to my great joy, and it's not an easy one to find. 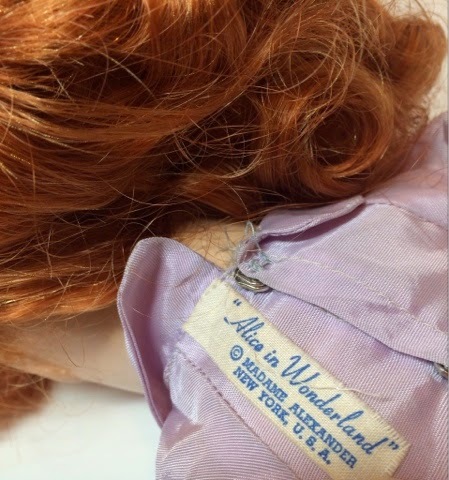 This is the taffeta Alice in Wonderland dress used on the 17 inch composition Margaret of 1946 and some of the hard plastic Maggies in 1950 and 51. 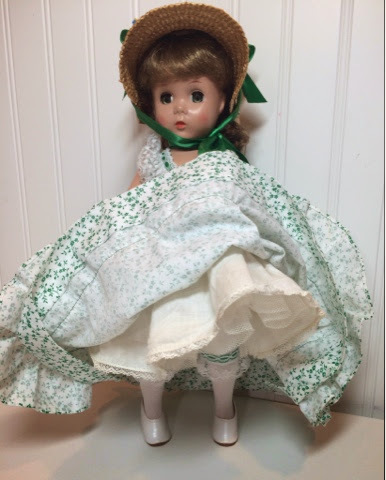 Still rare but more commonly seen is the 14 inch hard plastic Margaret wearing a blue dress with white piping trim and ruffled sleeves. The dress was originally light blue but has faded to lavender so evenly it's hard to tell that wasn't the original color. Amazingly, the very same night I got online to see if I could find a doll to match the dress and within just a few hours of arriving home I'd ordered and paid for her! 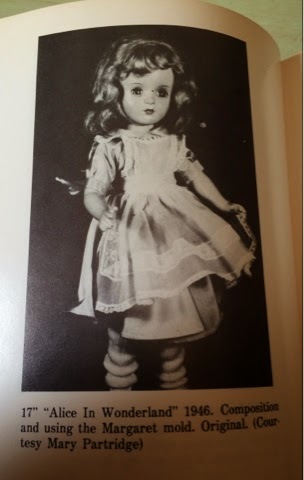 This is just one of those dolls who are fated! She had a nick in her eyelid paint. 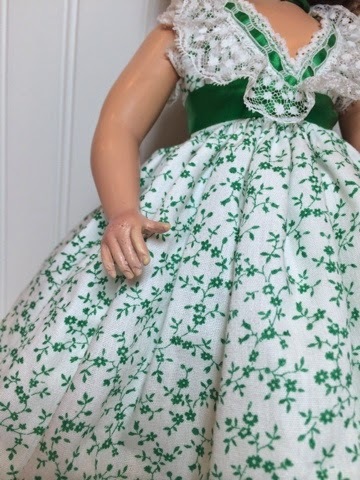 This Margaret doll is the 17 inch but she's hard plastic rather than composition. 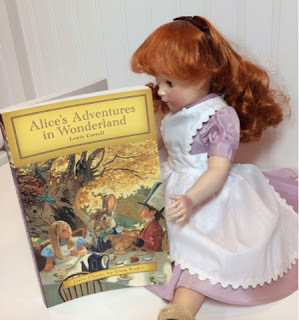 Her wig sure looked like the strawberry blond, or light red, mohair Alice wig, so it's possible she was originally Alice. 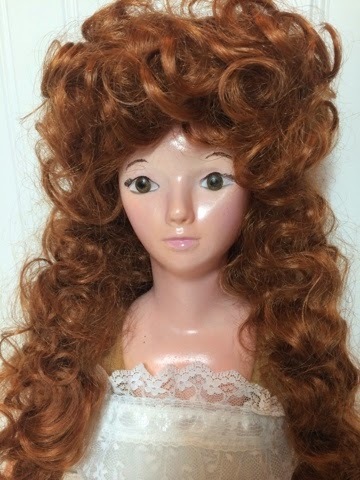 Her wig had unfortunately become matted, had glue in it, had lost most of its hair, and was seated funnily on her head as if it had been re-glued. I really wanted to save the wig and I tried to add human hair to enhance its fullness but I just couldn't get it to look right. I looked through my wig stash and found the closest possible to the original Alice-Margaret color and style. I know Alice is always blond now, but that's never stated in the books as far as I can see. I think it's a "Disney-fication". 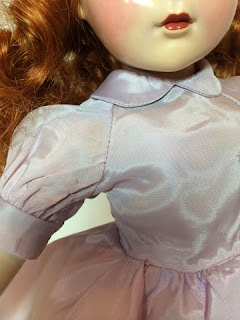 I was explaining that phenomenon to my daughter recently when my daughter was wondering why my Honey Cinderella doll was wearing a pink, rather than blue, dress. 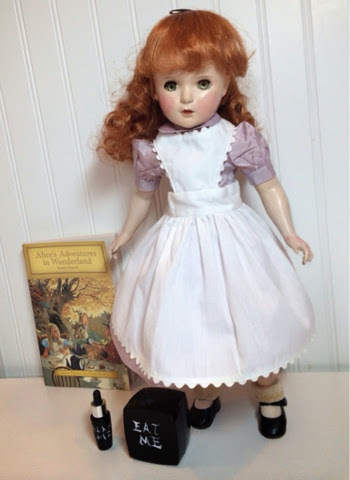 I decided to adhere to Madame Alexander's original vision for her Alice doll. There is a faint spot. I found a beautifully-sewn pinafore in the bag of clothing. It definitely isn't the Madame Alexander organdy pinafore original to the dress and I think it's almost too well made to be a factory piece. I wonder if the organdy pinafore fell apart and the mother made this one to replace it. 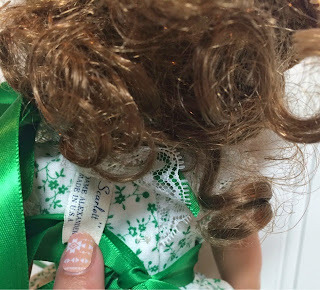 I had to move the hidden button closure over to tighten the waist, however, so perhaps it was meant for another doll. It's the perfect length and style for Alice, though! The socks have some holes. 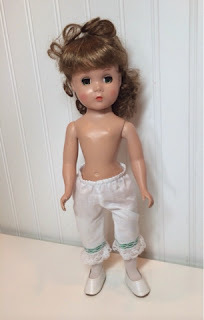 The Margaret doll came wearing Mommy-made pantaloons and an eyelet slip, so I kept those on her. I added vintage rayon socks and black shoes, and of course the "Alice band" ribbon headband. All together she's a really lovely classic Alice, instantly recognizable I think, even without her Disney blue dress and blond hair. The doll with new wig and paint. She has some paint rubs, especially in her joints. It was clear upon inspection that Margaret had a restoration at some point in the past. Parts of this were skillfully done. There is a nearly invisible repair inside the hip socket. I can see the restorer painted over scraping in the joints but it has started to scrape again. You probably remember my position on this issue as stated in my last post. I just don't see the point in painting something that's just going to scrape all up again. I did give Margaret new stringing. Her knee blush was present but her hand blush and her lower arms in general were faded from sunlight so I blushed those. I refreshed her cheek blush and painted the nick in her eyelid. 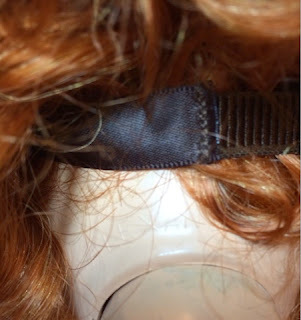 I was quite dismayed to find a crack in the top of Margaret's head when I removed her original wig. In fact, it was more like a deliberate cut, as though the previous restorer had been thinking of adding a pate inside her head such as those used for porcelain dolls. They only cut about an inch and a half and then stopped. Then they glued and taped the cut place to stabilize the plastic. 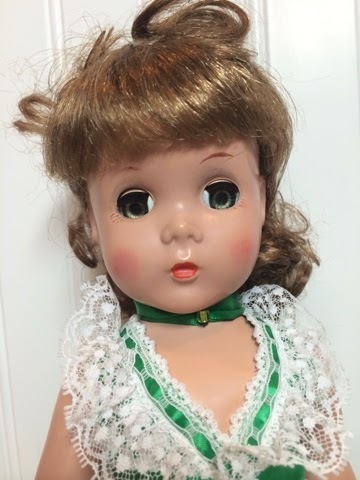 I would not have paid what I did for this doll if I'd known about that, but I can't blame the seller since you have to take the wig off to see it. It is stable, not near the eyes or head bar. 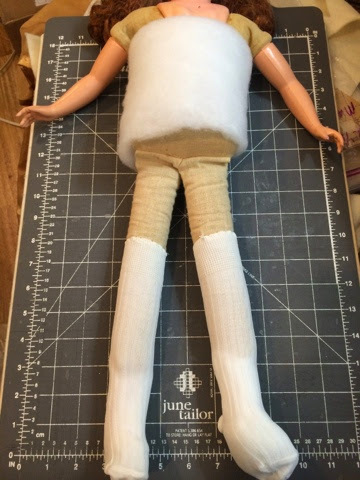 You can't feel anything and you can't see the cut under the wig, so I'm certain it won't affect the doll. I refreshed the cheek paint. I painted the nick in her eyelid and gave her a hair net. 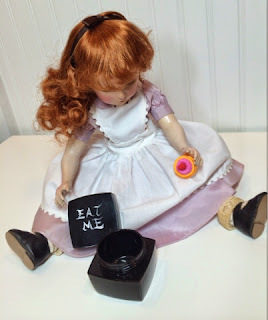 It so happens I've been planning a book and doll Alice in Wonderland set. I was going to use a Kimberly doll, but when I found the already made dress I listed Kimberly in her original 1980s Hang Ten clothes. I had finished the Alice accessories already, though: a box with a little cake inside that says "Eat Me" and a little bottle marked "Drink Me". These were cosmetic jars and when they were empty I cleaned them and scrubbed the lettering off them and painted the words on with oil paint. The cake is a puzzle eraser. I think this set is just too cute. I had a wonderful time taking the photos! I wonder what this will do? If the drink made me large, will the cake make me small? I'm glad something went well today because not much else has. We got eaten up by sand fleas at the beach, which you wouldn't expect this time of year. It was extraordinarily hot. My daughter, usually my well-behaved child, has been horrible lately and we had to go in for a conference with her teacher. My peas love the cold frame and have grown to about 6 feet and are just setting blooms, but now snow is forecast for tomorrow. So, I went out and tried to put the peas inside the frame, but when I removed them from the trellis the stems all got bent and now I'm afraid they're going to die. Everything about this house is just so frustrating. I feel like for every step forward I take I go back ten. Moles dug up my beautiful stone garden path, which I guess is just as well since I can't get anything to grow over there anyway. We still don't have a dishwasher, since everything I want in the kitchen is, for one reason or another, apparently impossible. Now the old dishwasher, which has water trapped in the pipe, is starting to stink and I don't know how to remove a dishwasher so I can take it to the dump. I have asked for help in this area but my pleas fell on deaf ears. So, now my sister is coming to visit and my house stinks... just a crummy week for the most part! I hope next week will be better. You can find this doll and many more in my store, so please check: http://stores.ebay.com/atelier-mandaline. A few months ago I restored a Madame Alexander Maggie doll who came needing re-stringing, painting, cleaning, and a new wig. I had a lot of fun re-styling her into a ballerina in blue. 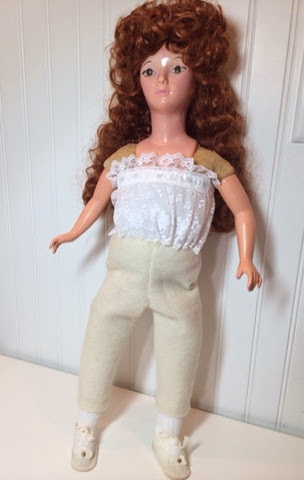 As you all know, I very much enjoy starting from scratch with a doll so I can inject a personality and design her clothes and outfit myself. One of these days I may have to start making my own dolls full time, but as it is, I can re-design these old dolls very often almost as if I made them entirely from my imagination. 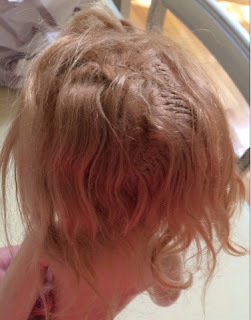 Because this doll was meant as a ballerina I styled her wig into an elaborate updo. 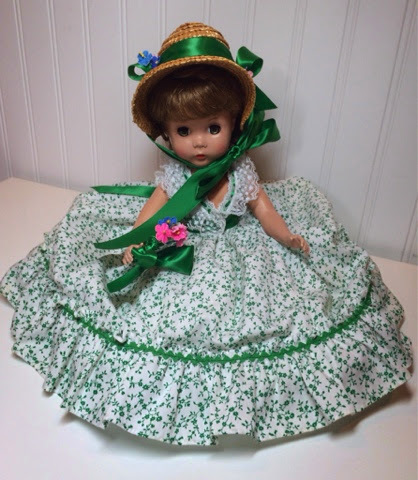 Then, a customer came along who wanted to purchase the outfit only, not the doll. Since the ballerina costume wasn't original to Maggie I went ahead and sold it, but then I had a doll with very fancy hair to re-dress. A southern belle ball gown turned out to be a perfect solution. 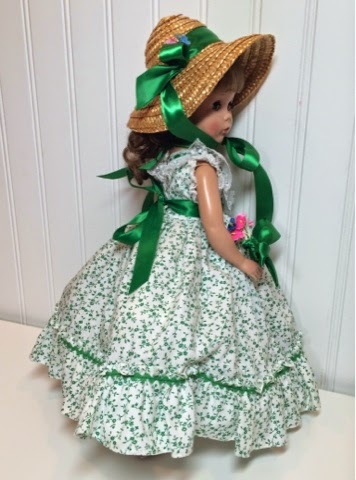 This dress went to a Madame Alexander Scarlett doll from the 1980s, I believe, but it can still be used as a generic southern dress. 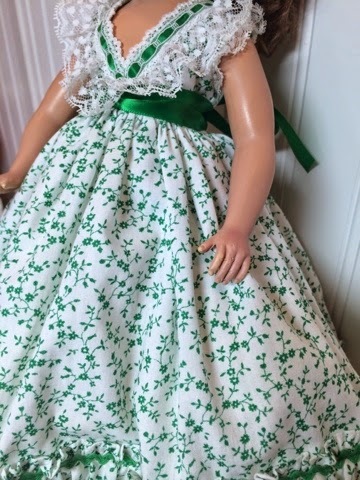 Madame Alexander, canny business woman that she was, had already marketed both Southern Girl and Southern Belle dolls, royalty-free of course, before Gone With The Wind ever premiered in theaters! My Maggie is designed in the same tradition as those dolls. 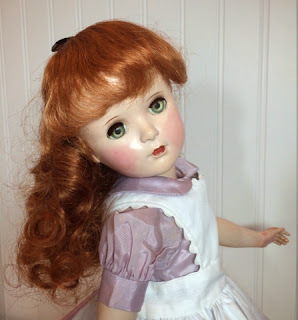 Maggie is a lovely doll with only a few minor flaws remaining. 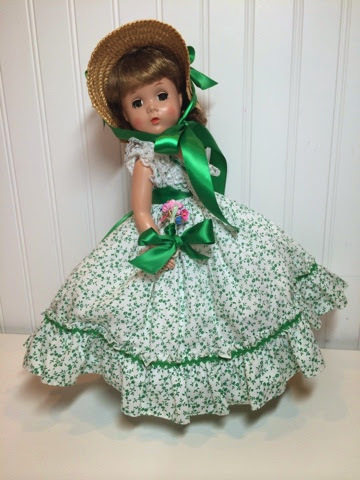 The Scarlett dress brings out her green eyes. At some point someone chewed up her fingers and the paint is scraped up in her joints. I started to paint the joints but the paint was scraping up again so I didn't bother with her hip joints in the back. 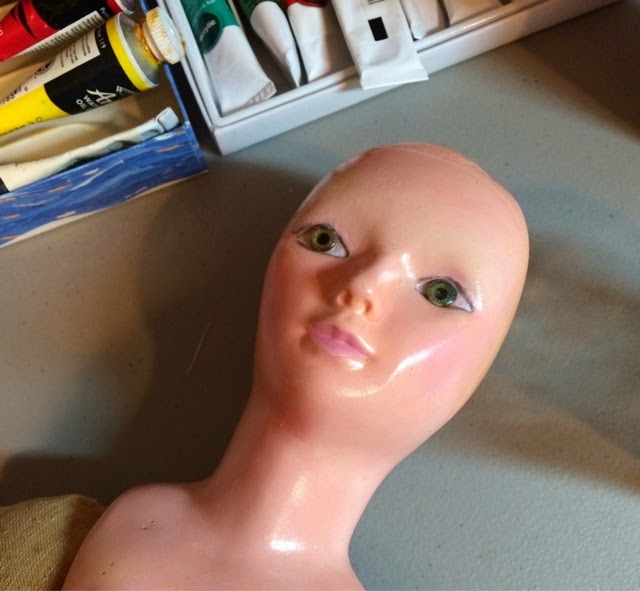 I don't have a air brush or any room to set up a spray booth so I can use one, so I have to paint my dolls with makeup sponges to get a smooth finish. 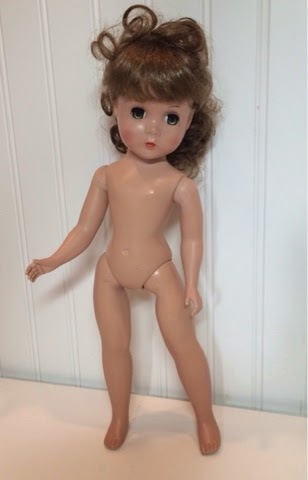 When I had this doll marketed as a ballerina someone emailed me to complain that I hadn't epoxied her fingers or painted her with an airbrush. Now, I don't own an air brush, but I am pretty sure oil paint holds up about the same whether it's applied with a sponge or an air brush, and I haven't ever had any luck keeping the paint from scraping up in the joints. 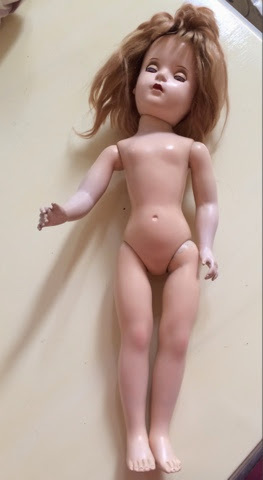 I've tried sealing the paint with polyurethane, I've applied paste wax, I've tried gloss and matte varnishes... no matter what, as soon as I move the doll's limbs the paint scrapes again and then it looks even more noticeable than before. If anyone wants to share any tips I welcome the advice! I left the scraped paint in these joints. I painted over joint scraping on the front, but the paint is already scraping again. The fingers also fall into the category of something that would be more obvious if I tried to "fix" them than not. 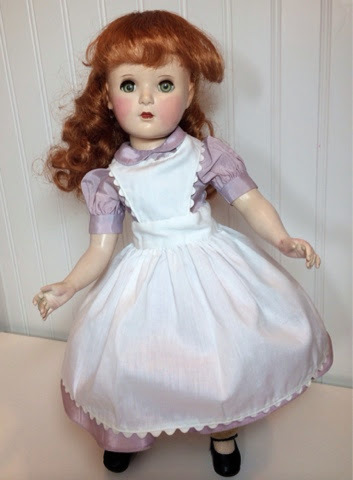 I came to this conclusion with my Cissy bride doll. I epoxied her fingertip, which was chewed, and it ended up larger than the other fingers. I couldn't get the paint to exactly match. I had to hide it with the bridal bouquet. I painted over these chews and that seemed to camouflage it as well or even better than the epoxied Cissy fingers. I decided from now on I'm only going to sculpt fingers if they're actually missing. I just think, sometimes less restoration is more. The value of a heavily restored doll isn't going to be much more, and it could even be less, than an original doll who shows some age. Some people are never going to be happy and will always have to try to tear other people down to lift themselves up. I know that and try to remind myself when I hear from one of the "hater" doll people who unfortunately abound. You'd think doll people would be a cheerful bunch, for the most part, but I guess you get a few bad apples in every barrel. 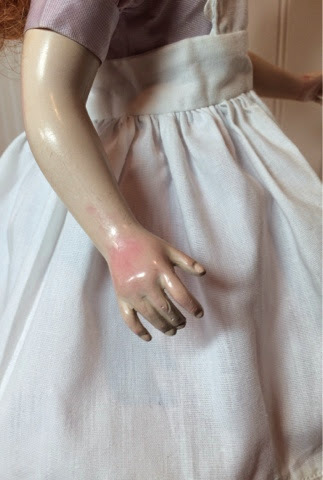 I gave this doll a bouquet to carry (a "nosegay" as she would have called it back then) and it covers the hands nicely. I just painted over finger chews. 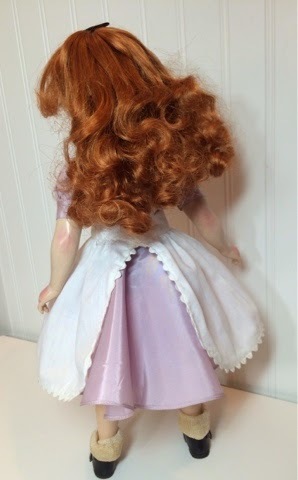 The Scarlett doll who donated this dress has a few flaws from play and several of the pieces of the outfit were lost. 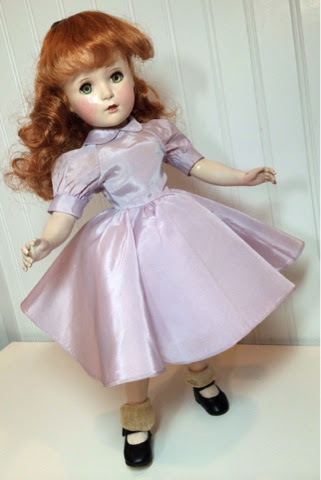 I didn't feel bad about taking her clothes, and she is for sale as a doll to dress in my store. The remaining outfit is really wonderful. The dress is crisp, without any stains or tears. I replaced the elastic in the pantaloons' waist, but that was really all the care needed. 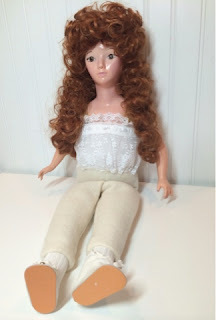 Maggie wears pantaloons and socks original to her dress with replaced shoes. I found a perfect hat in my "stash" and also happened to have some ribbon to match the dress. So often I am reminded of the value of hoarding! At least, that is, as long as I can stay organized enough to actually find everything, a real challenge for me. 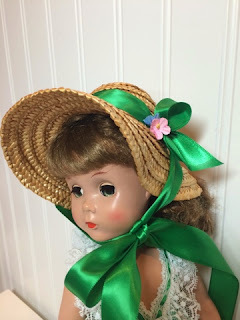 I trimmed the hat with the green ribbons and some vintage flowers. Then I also made a choker from ribbon and a glass bead. 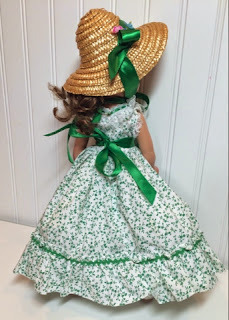 I trimmed a vintage hat to match the dress. I was thinking of making a hoop skirt to go under the dress, but I found a vintage Alexander slip for a smaller 12 inch doll that works. 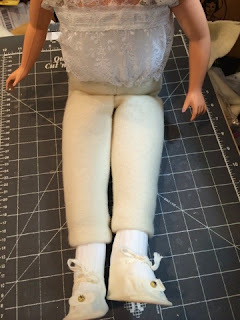 The Nancy Drew and Lissy doll clothes can sometimes fit Maggie, and the shorter length hits the skirt just where a hoop would, so it gives the proper fullness. The slip looks like a hoop skirt. 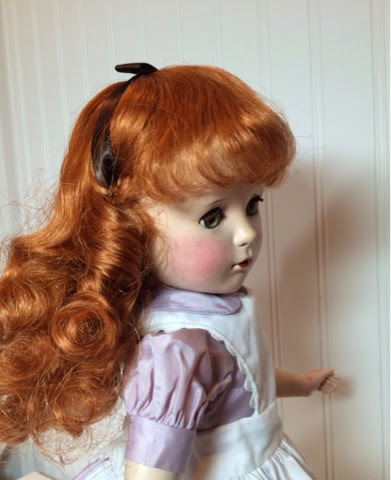 I'm glad I was able to finish this doll and the boudoir doll I wrote about yesterday. We took a long weekend at the beach because the kids didn't have school Monday, and I feel like I really got behind with the preparation for our trip last week. Now, of course, I have a mountain of laundry to wash and all kinds of stuff to put away and I need to clean because my sister and parents are coming to visit this week. This will be the third weekend in a row we've either had visitors or been away, and on top of all the school and band stuff it really takes a toll. An upside is that I try to visit new thrift stores whenever I'm away from home, so I have some neat new stuff listed. I have a huge pile of dolls in my office in various states of repair, and I'm trying to get at least one finished every day. 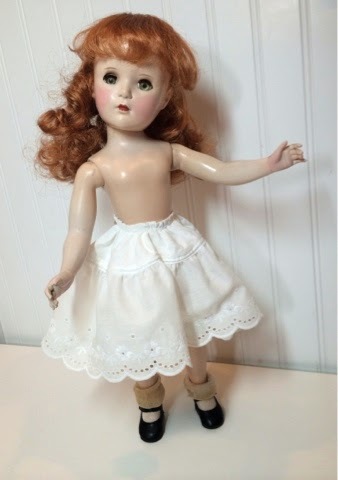 You can find this doll and many others in my store: http://stores.ebay.com/atelier-mandaline. Recently I restored a 1920s boudoir doll from my personal collection into a custom doll for a client. The same client wanted another doll to wear an outfit she already purchased. 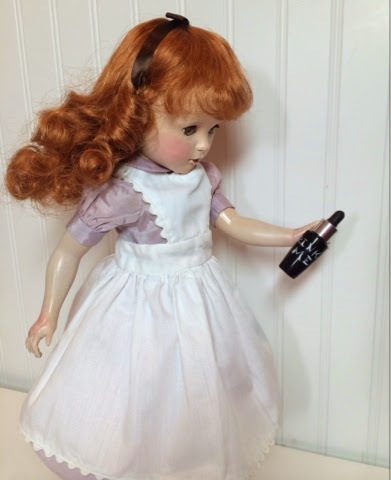 In this case she wanted a more childlike doll. The outfit's dimensions require the long, slender physique of a quite large porcelain or boudoir doll, however, and most of those depict adults. 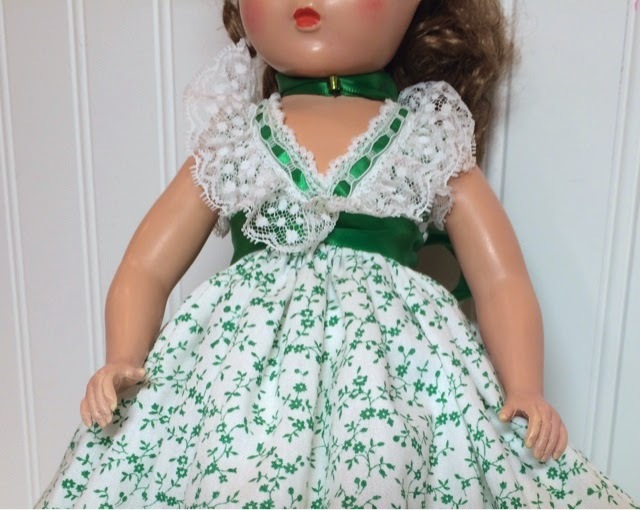 I searched and searched, driving to thrift stores up to an hour away, pouring over online listings, for a doll to fit the dress. In the end I wasn't able to afford a child doll. 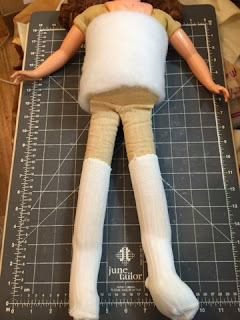 The doll needed to be 24 inches tall. 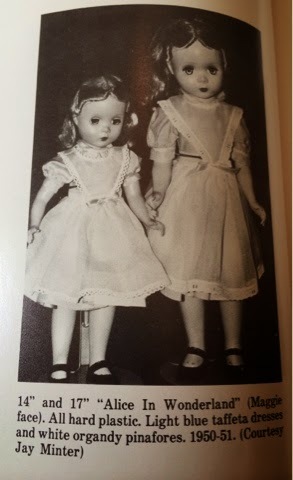 Truly vintage or antique porcelain dolls of the French bebe type, such as those by Bru or Jumeau, are enormously expensive and I wasn't able to find a cheaper reproduction tall enough. 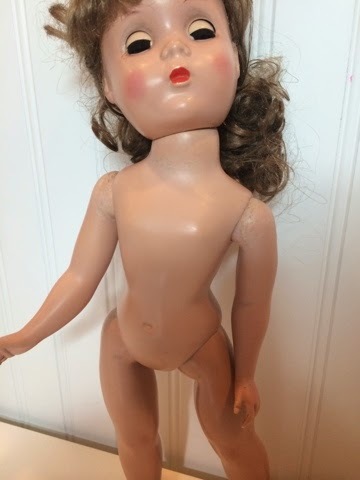 In the end I got a 1940s boudoir doll and restored her as a younger-looking doll. 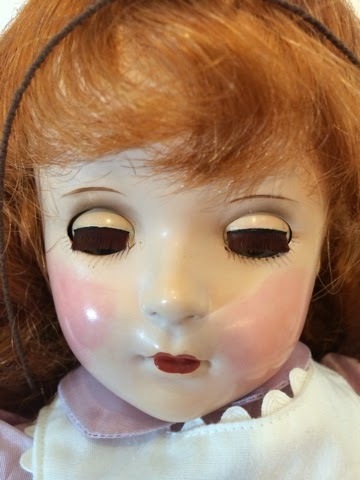 The doll originally had a short, curly mohair wig and dramatic eyeshadow and long lashes painted straight up to her eyebrows. The brows were high and arched like wings. Unfortunately, my "before" photo file has corrupted and won't display, so you're only going to see the "after" photos. 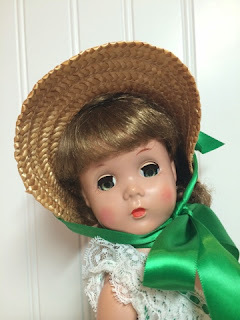 This doll was a perfect candidate for restoration because, although she was all original, one eye had discolored so one was brown and the other green. 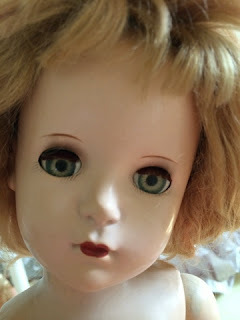 Her hard plastic face had black spots all over it. This is a common problem with the 1940s plastics. 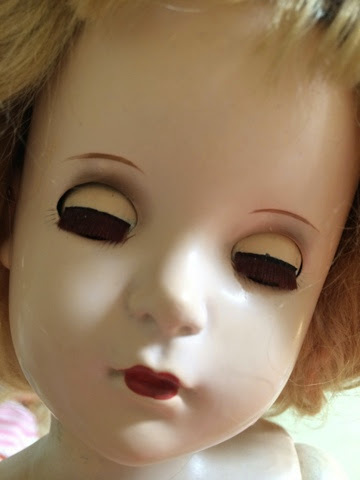 The spots can't be cleaned but hard plastic can be painted, so I painted over the spots with oil paint, removing her makeup in the process so she looks more like a girl. After the face re-paint I also painted her eyes so they matched. My client requested brown eyes, so that's what I did. The doll originally had high heel feet. Padding alters the body's shape. 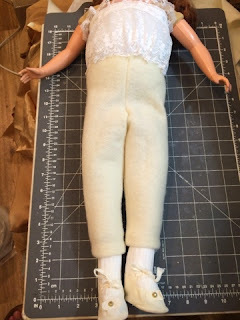 Since my customer wanted a younger girl doll I covered up the doll's original high heeled feet with quilt batting sewn around the shoes. Then I covered those with socks and sewed them to the legs. 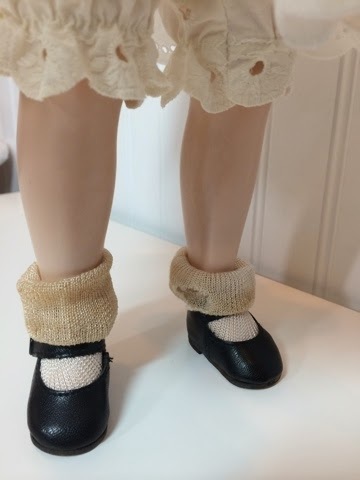 The doll is now able to wear girl's Mary Jane style shoes, reproductions of the 1920s and 30s originals. 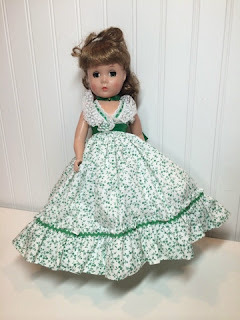 The dress required the doll to be a bit fatter (why can't that ever happen to me?) so I wrapped her waist with quilt batting to make it about two inches smaller than the finished waist measurement of the dress. She should now fit the dress without it being too tight. The head was originally stapled on. 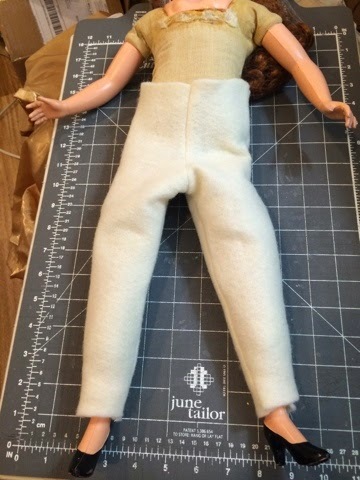 This doll's head was originally stapled to the cloth torso. 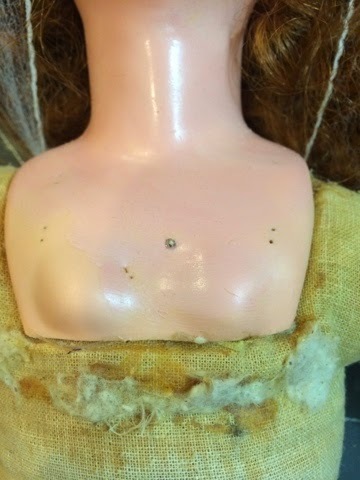 Her staples were missing on the front, however, and someone tried to glue the head back on without success. 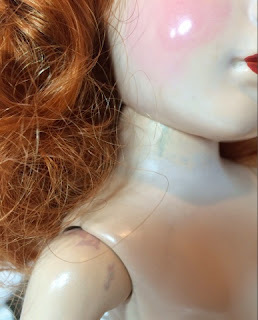 There was padding glued to her cloth chest to make a larger false bust. I removed the bust padding before sewing the waist padding in place. Then I glued the chest place back down and also dipped a pin in glue and pinned the chest in place. When I was finished I made a sort of shirt out of lace ribbon to hide the old staple holes and pin and to cover the quilt batting so it won't catch on stuff. 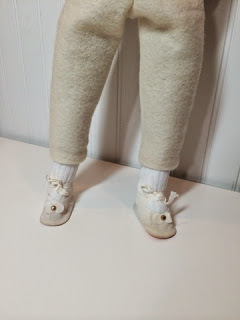 The client requested leggings, so I made some out of wool felt. All the clothes are sewn on, as a boudoir doll's traditionally is, but the shoes can be removed. 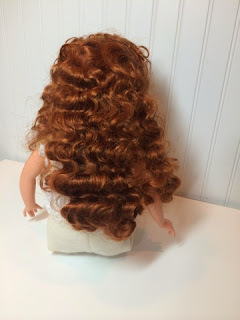 My client wanted a long curly wig on the doll because her outfit has a bonnet and the long hair peeking out will look cute. I took photos of several wigs and glued on the one my customer chose. It really is perfectly shaped to show under the bonnet! So, now our boudoir lady has been returned to youth, probably about a pre-teen age on the brink of womanhood. If only I could make myself look like I've gone back in time so easily! As always, please contact me to order your own custom doll or creation and check out all my finished pieces in my store: http://stores.ebay.com/atelier-mandaline. The doll can stand if propped up now that she has stiff felt leggings and flat shoes.